Recently named by Forbes as one of the worlds 100 most innovative companies, ASSA ABLOY will showcase new products and solutions for a wide range of end user markets, bringing competitive advantage to OEM and system integrator partners, and improving customers' lives through greater security, safety and convenience. At IFSEC 2014, over 15 access control providers and OEMs showcase Aperio® wireless lock technology as part of a suite of security products. The Aperio® range, which now includes battery-powered online and offline locks, cylinders, and escutcheons, is ideal for replacing mechanical master keys and integrating unwired doors into a building's access control system. 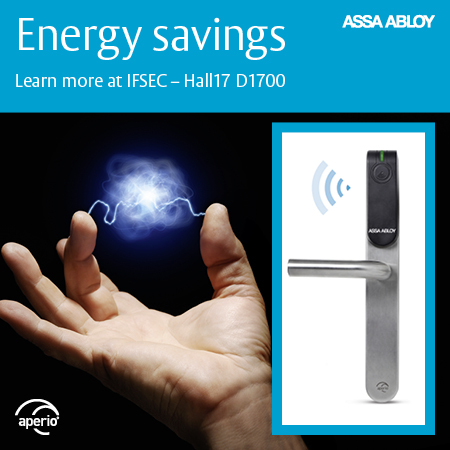 On the ASSA ABLOY stand, D1700 in Hall S17, visitors can watch Aperio® integration in action. With live systems from Gallagher, G4S, TDSi, and ACS up-and-running in the hall, ASSA ABLOY will demonstrate proof-of-concept for its Aperio® range. And more than simply affordable to install, Aperio® technology is also affordable to run. Energy is a hot topic among access control professionals, and here Aperio® really delivers savings. ASSA ABLOY calculations suggest that, in a typical 1,000-unit student accommodation block, customers installing Aperio® battery-powered locks would save at least 12,000 per year in running and maintenance costs alone, in comparison to wired access control doors. Aperio® expertise is on show elsewhere at IFSEC, too. ASSA ABLOY access control specialists will also be speaking at the IFSEC International Academy Conference, about the future of commercial building security. For programme details, see ifsec.co.uk. For more information on the global range of door security and access control solutions from ASSA ABLOY, visit assaabloy.co.uk/IFSEC2014.